Leo Loves Aries is a sweet slow burn M/M romance with HEA. This New Adult college GFY friends-to-lovers novel can be read as a standalone. I can’t even do this book justice with my review, just know that I freaking loved this book!!! I normally hate slow burn romance books, but this one just worked! It sucked me in and I couldn’t put the book down. I just loved Leo and Jamie and then Leone and eventually Sean. The chemistry between Jamie and Theo was off the charts and I also loved how the author handled Leone and her being blind. As soon as I finished this book I dove into the next book, which is a short story called Leo Tops Aries (Signs of Love #1.5), which was amazing as well. I simply cannot wait until the second book comes out!!! If you're new to Anyta Sunday, all of her fans expect a slow-burn romance, witty, humorous banter, and fully developed heroes with engaging side characters. The pacing is slightly on the slower side, but not bogged down with unnecessary detailing. The plot is character-driven, without a ton of bells and whistles to distract from the flawless storytelling. Leo Loves Aries is based on the compatibility of the astrological signs. Theo and Leone are twins who were both ditched by their boyfriend and girlfriend, when the pair fell in love with each other. Feeling the burn when they receive an invitation to their exes' upcoming wedding, they vow to find the other a date, to prove they are over them. Amongst the angst of past hurt, the twins are in need of a new roommate. Jamie walks into their lives, a past tutor of Theo's, and their world opens up in ways they didn't imagine. Theo hasn't ever truly connected with another human being, not as tightly as he has with his twin. What he felt with his ex was bland, uninspired, but he assumed that's how it always is. As his friendship grows with Jamie, the connection is intense and life-affirming, but Theo is emotionally blind, whereas his sister is physically blind. Leo Loves Aries is the slow-burn journey as Theo comes to terms with falling in love for the very first time. The reality of the emotion. While his sister falls head over heels too. Theo is our narrator – his personality is infectious, even his flaws. The banter between him and everyone is humorous yet never over-the-top. It's written in a dry, witty way that suits my reading style best. The side characters are just as appealing. The twins' mom is a zany character, obsessed with astrology. Jamie's mom is quintessentially an understanding, supportive mom. Leone and Theo's friends, Ben and Kyle, are awesome. Jamie's BFF Sean is a solid guy. It was refreshing to see a supportive cast actually be supportive, with normal human emotions, instead of being vindictive or flighty. Leo Loves Aries was a soothing, relaxing, romantic book, with a ton of heart-string tugging. The angst and humor weren't over-the-top, and I had no frustrating urges as I read. It was a pleasure to sit back and relax on a dreary Sunday. Recommended to Anyta Sunday and MM romance fans. *Note: I've stated this in past reviews of books by this author, and others. I don't down-rate due to this, but I do know there are sticklers who may become irritated by it, which is why I mention it. Using the word-spelling of the writer's origin is acceptable and unavoidable. However, if writing a story while using colloquialisms, slang, and the differing word usage from the region, it throws the reader. Also, destinations and times of travel must be taken into account. If you're not from the region, a bit of research is in order. I wasn't sure the locale of Leo Loves Aries until I saw commentary on Lake Erie, which had me doing a double-take. I discovered they lived in Pittsburgh, and were traveling to places which would take much longer than the 4 hours stated – MUCH longer. 12+ hours of nonstop driving, actually. It's not a hop and a skip and a jump from Pitt to Wisconsin and Minnesota. As a Pennsylvania resident, I can guarantee no one from the Mid-Atlantic, Midwest, or New England would use singlet as a term. Which is why I thought this story didn't take place in the US. However, I am happy to see that there weren't as many of these issues cropping up as in books in the past. Other than singlet and the wrong travel times, I thought the author did a wonderful job bridging the gap to sound as if the characters were born in the US. A born and raised New Zealander, Anyta Sunday has been exploring the literary world since she started reading Roald Dahl as a kid. Inspired, stories have been piling up in her head ever since. Fast forward to her mid-twenties and jump a few countries (Germany, America, and back again), and she started putting pen to paper. When she’s not writing or chasing her kids around, she’s reading, hiking, watching a Joss Whedon series, attempting Pilates, or curling up with her two cats. 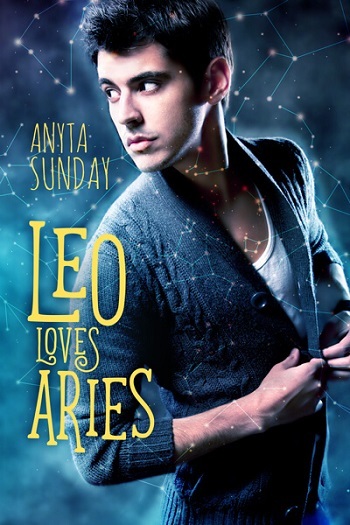 Reviewers on the Wicked Reads Review Team were provided a free copy of Leo Loves Aries (Signs of Love #1) by Anyta Sunday to read and review.